Wives and Daughters was one of those little treasures I discovered completely by accident. 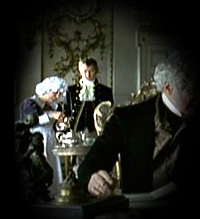 I was searching Amazon for Jane Austen DVD's, and followed a link to this delightful BBC miniseries. The story is based on the unfinished Victorian novel by Elizabeth Gaskell, and revolves around Molly Gibson, the town doctor's daughter, and her step-mother and step-sister. Not that the men in the story aren't important. They are. In fact, it's the women's relationships with the men that causes all the conflict and interest in their lives (not unlike today). Thankfully, there's a happy romantic ending added on by Screenwriter Andrew Davies. 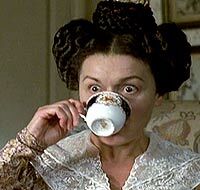 But, focusing on the topic at hand - tea - I'm including here some of my favorite "tea moments". 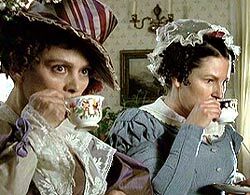 One of my favorite scenes takes place at the Miss Brownings where our ladies are gathered for afternoon tea. The conversation slips outside the bounds of normally acceptable "light" conversation. It's not only a serious topic, but it shocks and offends some of the ladies, those involved become highly emotional, and everybody is uncomfortable. In the shocked silence that follows the last outburst, the ladies lift their cups and sip their tea as one, hiding their discomfort in the return to ritual. These pictures don't do justice to the moment, I'm afraid. 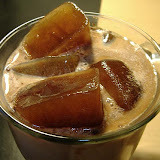 It's quite funny to see them all retreating behind their cups in sync, a choreographed dance of custom and convention. I found it interesting to observe who poured the tea in the various settings, according to their class and rank. 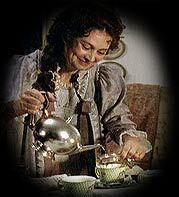 For instance, at the Miss Brownings', who were lower to middle class women, a servant assisted, but one of the Miss Brownings had the main responsibility of pouring tea for all the women gathered. Whereas, at the manor when the high mucky-mucks ... er, excuse me, when the Lords and Ladies had tea, servants did it all. The only variation was when Clare came to visit. Instead of servants pouring, Clare did the job. Since she had previously been governess in that household, it was acceptable - and a mark of her lesser status - for her to take on the role. In the comfort of her own home, as the new Mrs. Gibson, Clare takes great pleasure in pouring for her husband. In this instance, it's a mark of her new elevated status as wife, and we never see either of the two younger girls being allowed to pour the tea. In this scene you can also see the "plain" china the family uses for their everyday meals and tea, as opposed to the fancy cups used when company comes for tea. There's no coffee in this film, sorry to say, but plenty of tea. And for the fan of Victorian era romances, it's just the thing.